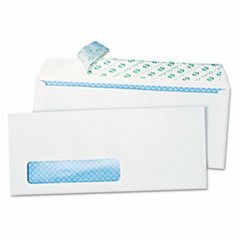 * Self-adhesive Redi-StripTM flap provides a secure seal. Protective paper strip keeps the self-adhesive closure free of dust. Wove finish adds a professional touch. Heat-resistant adhesive. Envelope Size: 4 1/8 x 9 1/2; Envelope/Mailer Type: Business/Trade; Closure: Redi-StripTM. If you have any questions about this product by MOT, contact us by completing and submitting the form below. If you are looking for a specif part number, please include it with your message.